The North Beach Town Center guidelines, with a maximum height of 200 feet as recommended by the City’s Planning Department, passed on first reading earlier this month, but refinements are expected to be made at this week’s Commission Land Use and Development Committee meeting that might include staggered heights, with lower height given in the 69th Street residential area and taller buildings allowed in the core of Town Center on 71st and 72nd Streets. 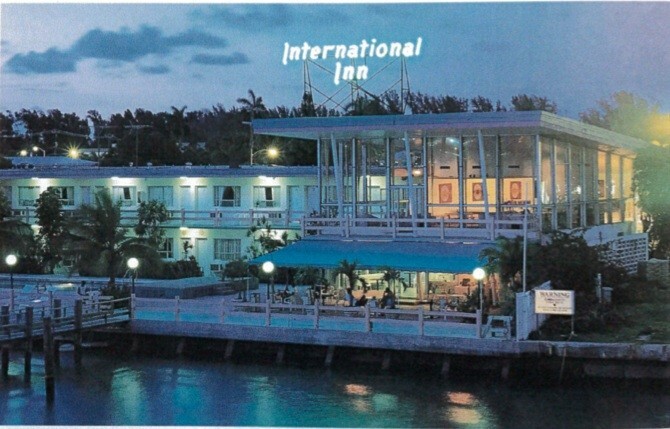 That is not a new discussion, but one Miami Beach Commissioners continue to grapple with. The slow pace of the Town Center development regulations since last year’s voter approved increase in density to a 3.5 FAR (Floor Area Ratio) has claimed at least one victim. Developer Silvia Coltrane, whose hotel project is planned for the block at 72nd and Collins (above), said she lost her hotel flag due to the lack of progress in the area. Most of those, up to six, would be located in the 71st and 72nd Street areas, “where they will face a park rather than any existing residential structures,” according to MEAI. Commissioner Kristen Rosen Gonzalez opposes any height increase above what was recommended in the North Beach Master Plan created by Dover Kohl. “What happened between the Master Plan … and what you are giving us right now?” Rosen Gonzalez asked Rogelio Maddan, the Planning Department’s Chief of Community Planning and Sustainability. Rosen Gonzalez believes voters thought they were getting a maximum of 125 feet in height when they voted to allow increased density in the Town Center area in exchange for new protections on older homes. Nancy Liebman, co-chair of Miami Beach United, and one of the key participants in a compromise between developers and historic preservationists to allow increased height for new historic districts said, "The only reason that we’re here today talking about how high or whatever’s going to happen is because of a community compromise that brought this community together. Otherwise that FAR would never have passed. We and the preservation community were happy to support a project for 71st Street and its environs. We were happy to work with it and watch what was happening, but now somehow the compromise has gotten out of control.” She noted the Planning Board’s approval of 220 feet and a developer’s request for 240. Brad Bonessi, an Ocean Terrace resident and member of the North Beach Steering Committee, was dismayed to learn Coltrane had lost her hotel flag. “We have to get something rolling here… We have to come together with something,” he said. “When I hear people like Silvia Coltrane, if she’s going to leave this project because of losing a flagship, which I didn’t know until today... I came here to speak about [other things] but… we have to get this done,” he emphasized. 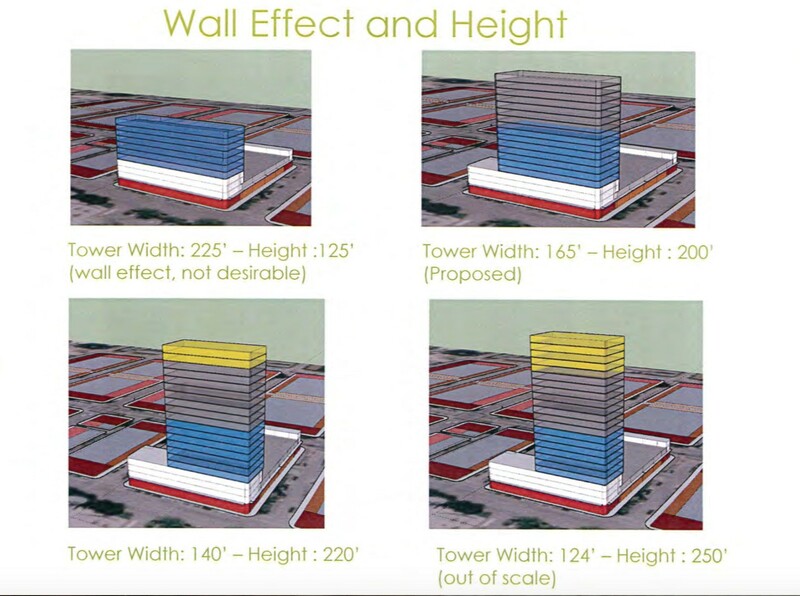 The Master Plan also indicated new buildings should “invite a lot of air and light” but the 125 height recommendation with a 3.5 FAR “didn’t account for a wall effect,” the result of having to build short, block-type buildings to accommodate the new allowable density. “It is their professional recommendation that short and squat like me isn’t the way to go… that you want a height, that has air and sight vision,” Morales said. “I haven’t heard anybody say they’re wrong from a planning perspective, it’s all more about the grand compromise… we’re all on the same page on so much of this... I think we can, hopefully, intelligently or artfully agree or disagree but have a discussion on what’s going to look best … The Planning team told us what they think is best… I support their recommendation and adopted it as mine” in the staff memo. He said he understands the concerns expressed about the process. “A certain number of height was latched onto and, maybe looking back,” he said, there might have been a way “to help [residents] better understand" the process that would happen after the vote which, he said, “was the step on a journey but it wasn’t the final answer. But for a lot of people, they heard that was the answer so that was a complication. Nothing mischievous going on but I could clearly see a lot in the community thought we had an agreement” of 125 feet in maximum height. “We now have to do what’s right with the information that we have,” Samuelian said. “Our goal is revitalize… we need to make sure we get shovels in the ground,” With regard to the public benefit being tied to obtaining a permit within 15 months he said he wasn’t comfortable with that being the only milestone and suggested incorporating temporary certificates of occupancy (TCOs) into the mix. “On the topic of height, this is a tough one,” he said. “I’m open to considering going above 125. For me, at this point, I find it hard to believe that we would get anything above 200.” He said he would support the proposed guidelines on first reading, knowing the options for variations in height based on location or lot size would be further discussed at the Land Use meeting this week. Commissioner Michael Góngora has proposed restricting height by size of lot, with greater height on larger lots and lower height on smaller lots, hoping to restrict the height around the 69th Street residential area. Góngora’s “staggered tier system” was of interest to Commissioner Micky Steinberg. Sanchez said the Planning Department wanted more time to analyze that proposal because they didn’t want to create property owner holdouts who would hold hostage a developer that needed a small piece of land to amass a larger parcel that would be eligible for the tallest buildings. For this week’s Land Use meeting, staff has recommended against the lot size criteria and instead suggested larger setbacks closer to 69th Street. On first reading, the Commission voted for heights of 125 feet but not above 200; to consider including the tiered approach to height; and to finalize and define the public benefits piece allowing additional height for developers who obtain a building permit within 15 months and a TCO or Certificate of Occupancy (CO), whichever comes first, within a certain number of months from obtaining the full building permit. “The biggest risk is that we line up with all of the other commissioners over the past 25 years that tried and failed [to revitalize North Beach],” Commissioner John Alemán said. Alemán, Chair of the Land Use Committee, said, “I feel we’re very close so let’s keep it going." The vote was 6-1 with Rosen Gonzalez voting no. “Accordingly, MEAI believes that the amount of the Public Benefits Fee should be set at a level that will enable the City to share in the enhanced financial performance enjoyed by the developers of projects that exceed the by-right height to the point that it can collect significant amounts of money to address community needs, however, we also believe that the amount of the fee should be viewed as an add-on to the increased ad valorem taxes that the prospective project can be expected to produce by virtue of its enhanced revenue potential, thus also set at a level that will not run risk of deterring them from building structures that are taller than the by-right height on the sites that can accommodate such structures,” the report states. “MEAI believes that the calculation of the proposed Public Benefits Fee should be based solely on the square footage of rentable or saleable space on the floors within a structure above the by-right height… As a result of the analysis MEAI performed, we suggest that the Public Benefit Fee should be paid at a rate of $3 per square foot of rentable or saleable space above the by-right level. This suggestion assumes the land development regulations are adopted as currently drafted by the Planning Department rather than in accordance with previously referenced proposal by Commissioner Góngora at the Land Use Committee meeting on July 31, 2018” for height based on lot size. Staff chart analyzing height and public benefits along with consultant’s report on public benefits here.